The Fall Cotton Patch Quilters’ Challenge is to create mini quilts inspired by art! You may choose any piece of art to inspire you- it can be classical or modern, anything from a masterpiece from a famous artist, a painting by a local artist hanging in a small gallery or folk art. Just take a specific work of art and translate it into fabric and thread using your unique artistic vision. 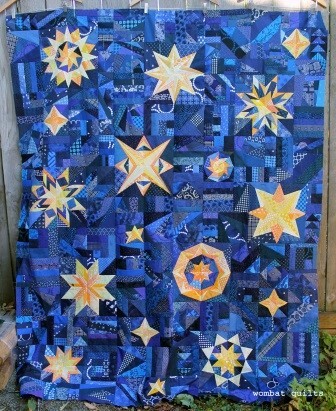 For example, the first picture below show a quilt made by Australian quilter Cath of Wombat Quilts, inspired by the second picture, The Starry Night painting by Vincent Van Gogh. SIZE: Your mini quilt should have dimensions from 9×9″ to 20×20″…any size or shape in between. CONSTRUCTION: Pieced or appliquéd, quilted by hand or machine; and bound. 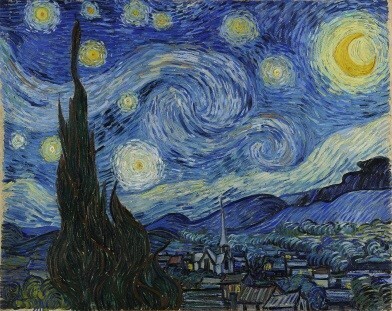 INSPIRATION: Please bring a photo of the artwork that your quilt was inspired by.